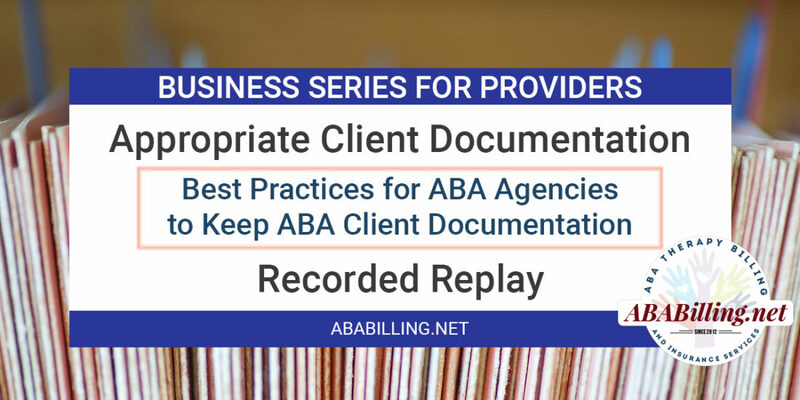 This webinar is designed for current or future owners of ABA agencies to develop a better understanding of the necessary clinical documentation for clients from intake through treatment to eventual discharge. Participants will learn: (1) how to perform a comprehensive intake to ascertain the necessary information for insurance companies and to determine appropriate clinical treatment; (2) ways to maintain clinical documentation required while providing ABA therapy and monitoring client progress; and (3) finalizing documentation for discharge for clients and maintaining client records. Brian Conners, Ed.S, BCBA is a Board Certified Behavior Analyst and New Jersey Department of Education certified school psychologist with over 10 years experience in the field. He originally developed the graduate program in Applied Behavior Analysis at Seton Hall University and is a Faculty Associate at the university teaching courses in Applied Behavior Analysis and special education. He has worked within various sectors as a behavior analyst and consultant including public and private schools, psychiatric hospitals, and community agencies. He also was the former owner and Chief Executive Officer of a nationally recognized Behavioral Health Center of Excellence for four years. He specializes in providing behavioral treatment to clients with severe developmental disabilities, emotional and behavioral disorders, and psychiatric conditions. His clinical areas of expertise include behavioral crisis intervention, behavioral assessment, and providing treatment and interventions for clients with the severe problem behaviors of physical aggression and self-injury. He has presented at state and national conferences and has published articles and book chapters in school psychology and special education on behavior management strategies, behavioral crisis intervention, restraint and seclusion practices in schools, and multiculturalism and diversity issues in behavior analysis. He currently maintains a private practice, where he provides ABA consultation and public speaking engagements on various topics in ABA, school psychology, and special education.